It’s one of those things that I’ve gone back and forth about for years. 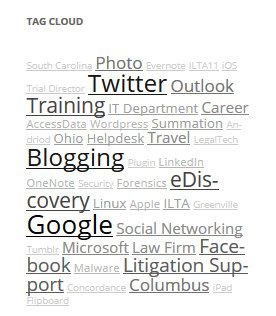 I never started this blog with the idea of adding tags to posts. In fact, when I started it way back on Blogger, I don’t even think you could. By the time I could, and wanted to, I had years of old posts without tags. Going back and trying to tag those items seems like a ridiculous amount of time and effort. So it hadn’t ever happened. Lo and behold, a couple of weeks ago, I heard about a WordPress Plugin called Simple Tags. Not only does Simple Tags let you create auto tags, so even if you forget to tag a post, it can assign tags based on keywords, but it lets you go back and do the same thing for all of your posts. Now, basing it solely on matching keywords isn’t a perfect solution, but in this case, there was no reason to let the perfect be the enemy of what is clearly better than doing nothing. So I came up with a list of keywords, and went ahead and let Simple Tags do it’s thing. For example, if I used the word Twitter, or Facebook, in a post, let’s go ahead and add that tag. Same for Apple, Google, Microsoft, and so on. So now there’s a nice set of tags, and even a tag cloud, to help you find more posts about the same subjects, and I can continue to fine tune my tags to create some interesting ties to posts on the same subject. Now I’m going to do the same thing over at the Child Abuse Survivor blog too, which has been going almost as long as this one.